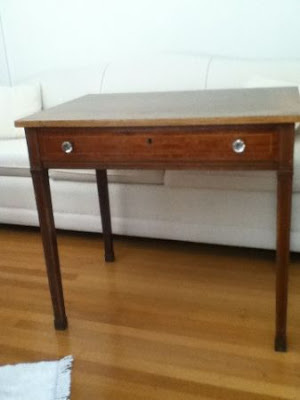 Off to SF I go (tomorrow) to pick up this table off of craigslist. I loved that the title of the post said, "Selling Grandma's Table." Those are always good words. I am ditching the family and get to enjoy a few hours just to myself (Happy Mother's Day to me!). I can't promise my minivan won't veer off at exits where thrift stores may be lurking. Would love to paint this baby white! My drawers are starting to fill back up with fresh, laundered baby things. I usually don't like knit pants, but the ruching got me (and the $0.99 thrift store price tag).